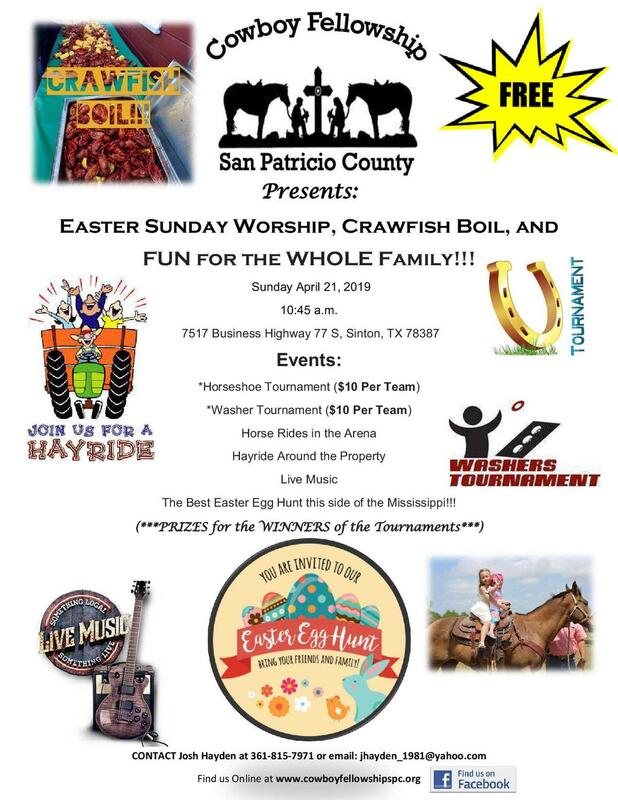 Worship Service, Egg Hunt and Crawfish Boil. We want to invite you to Cowboy Fellowship! Cowboy Fellowship is a church that welcomes everyone no matter who you are. We care about you because you matter to God! God sent his one and Only Son to this earth for you because He loves you and wants to have a personal relationship with you. Regardless of your life situation, you are important to us, and our desire is this is a place where the grace of God changes your life. God's love, His grace and mercy has changed our lives, and we know that God can change yours as well. We hope that you find this to be friendly, comfortable church and that you feel welcomed. We hope that your experience helps you to understand who God is and how much He loves you. We also want you to know that we love your kids! We offer and age appropriate children's ministry. Our children's ministry is a safe environment for preschool to high school. We strive to make Sunday morning the best hour of their week, We focus on teaching them that God loves them. Our purpose is to lead them to a loving relatinship with God and expand their knowledge and understanding of the Bible. So load up the family and make your way to Cowboy Fellowship, grab yourself a cup of coffee and make some new friends. We hope to see you this week!